Do you need a credit limit increase on your American Express credit card, but aren’t sure how to get it? You’re in the right place. There are a few ways to get a credit limit increase, and some essential things to remember during the process. Before you attempt to get a credit limit increase, be sure you know how to use your credit wisely. Spending more than you can pay off every month will result in interest charges and can damage your credit! What Should You Do If Your Request Is Denied? Why do you want a credit limit increase? There are both valid and frivolous reasons to want to increase your credit. Are you planning a large purchase that you’d like to put on your card? If so, be sure to tell Amex when requesting your increase — this is a legitimate reason to request an increase. Or are you planning on maxing out your new limit with purchases that you really can’t afford without using credit? In this case, your chances of getting a credit increase are slim (and you should consider re-examining how you use credit). Using credit wisely is important, especially when you’re collecting miles and points. You should pay your bill in full every month so interest charges don’t offset your rewards. Plus, if you carry a balance, your credit score will probably be negatively affected. If you haven’t been able to pay off your bill every month in the past, you’re probably not ready for a credit limit increase. Bottom Line: Paying off your credit card bill in full each and every month is key. Carrying a balance will not only burden you with interest charges, but it can damage your credit in the process. You should know what your current credit limit is before you request a credit limit increase. You can find your credit limit in your online American Express account. Once you log in to your account, choose the card you want by clicking on the credit card icon in the upper right corner of your screen. Image courtesy of American Express. Then you will be able to see your available credit limit in the Home section of your credit card account. This number represents your available credit, not necessarily your entire credit limit for that card.If you have recent transactions, those amounts will be deducted from your credit limit to get this available credit amount. In most cases this number will be close enough to your actual credit limit to help you decide how much more credit you can reasonably ask for. If you notice there is not a credit limit number, chances are you are looking at a charge card. Charge cards, like The Platinum Card® from American Express, don’t come with a preset spending limit. Rather, your spending power is determined based on spending patterns, payment history, credit records, and financial resources. While charge cards don’t have a credit limit, it doesn’t mean they offer unlimited spending — you still need to be responsible with your credit! Hot Tip: For more information on charge cards vs. credit cards, check out this in-depth piece dedicated to the topic. American Express allows you to ask for a temporary credit limit increase if you have an upcoming large purchase. While there is no fee for this service, your monthly minimum payment will increase. 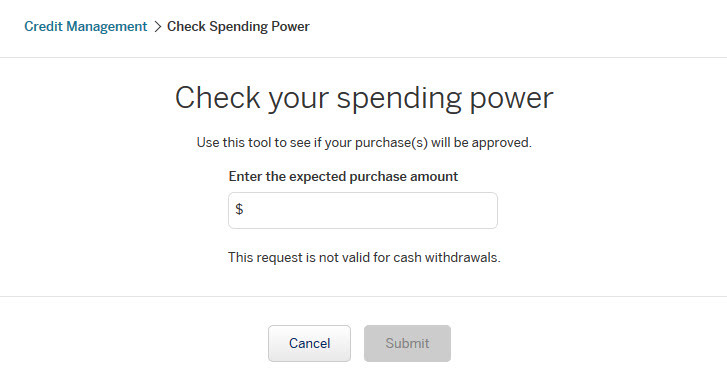 Check your spending power by clicking Check Spending Power in blue at the left side of your screen. This will be available on both charge and credit cards. From here, fill out the purchase amount and click Submit to try to get a temporary credit increase. The easiest way to increase your Amex credit limit is actually to open a new credit card. 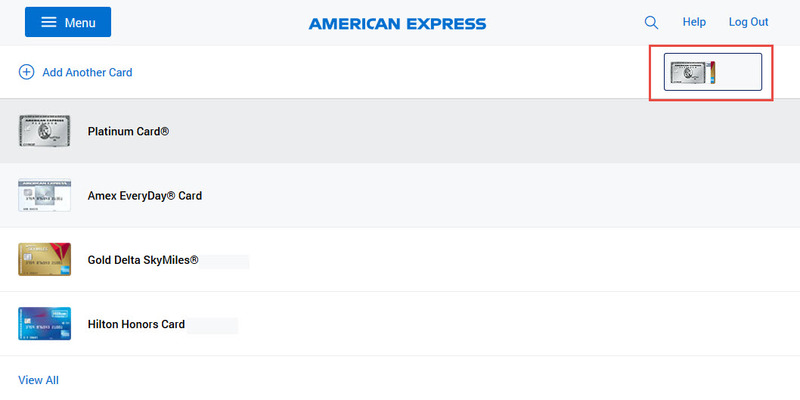 In addition to credit cards, American Express also offers charge cards, which are a little different. Charge cards have no preset spending limit, but they require you to pay your balance in full every month. Credit cards have a set credit limit and allow you to carry a balance from month to month (though it’s not a good idea!). American Express limits the number of credit and charge cards you can have at one time to 4. So as long as you don’t have 4 credit cards open, you can apply for a new one — the same is true for charge cards. Here are some of the best credit card choices from American Express. Once you open your new card, you can often transfer some of the credit from the new card to another if you would prefer your new credit to be on a different card. Earn 4X Membership Rewards® points at US restaurants. Earn 4X Membership Rewards® points at US supermarkets (on up to $25,000 per year in purchases, then 1X). $100 Airline Fee Credit: up to $100 in statement credits per year for incidental fees at one selected airline. Low intro APR: 0% for 15 months on purchases and balance transfers, then a variable rate, currently 15.24%-26.24%. For rates and fees of the Blue Cash EveryDay® from American Express, please click here. Earn 2X points on everyday business purchases such as office supplies or client dinners. 0.0% intro APR on purchases and balance transfers for 12 months, then a variable rate, currently 15.49%, 18.49% or 21.49%. For rates and fees of The Blue Business℠ Plus Credit Card from American Express, please click here. If you aren’t looking to transfer credit to an existing card but rather get new credit altogether, you can also look into an American Express charge card. These cards also offer great points-earning capabilities and perks for frequent travelers. Again, Amex usually limits the number of charge cards you can have open to 4, so if you already have 4 open, you probably won’t be approved. Access more than 1,200 airport lounges across 130 countries and counting, including the amazing Centurion® lounges. Up to $200 Uber Savings Annually. Earn 50,000 Membership Rewards® points after you spend $10,000 & an extra 25,000 points after you spend an additional $10,000 all on qualifying purchases within your first 3 months of Card Membership. For rates and fees of The Business Platinum Card® from American Express, please click here. Bottom Line: American Express offers both charge cards and credit cards. You can have up to 4 of each card type open at one time. Opening a new card is usually the quickest way to increase your credit limit. Have you been a customer for at least 60 days? If not, you will not get a credit limit increase. Some reports indicate you need to be a customer for at least 6 months before requesting an increase. Do you pay off your bill in full and on time every month? 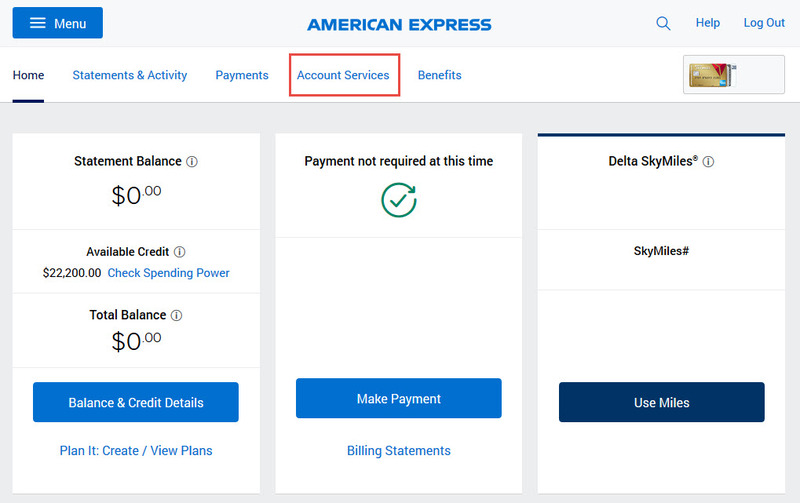 American Express will report your credit card account as delinquent to the credit reporting agencies if you don’t pay your minimum balance for 2 consecutive billing periods. Are you using a reasonable amount of your current credit limit, or is it maxed out? Your credit utilization ratio — meaning the percentage of your available credit that you’re using — is used to determine your creditworthiness. Try to keep this number as low as possible, ideally under 30%. Bottom Line: If you are a brand-new customer (less than 60 days) or habitually have late or partial payments, your chances of getting a credit limit increase are slim to none. You can submit a credit limit increase request directly on the American Express website. First, log in to your account and choose the card you would like to request the increase on. Be sure you are looking at a credit card and not a charge card. Click on Account Services in the main toolbar at the top of your screen. From the Card Management tab at the left, select Increase Your Credit Limit in the middle of the screen. Fill in the credit limit amount you are requesting plus your annual income, then click Continue to complete the request. If you are in the market for a credit limit increase, you will probably need to contact American Express and ask for it directly. Here are a few things to keep in mind before you pick up the phone. Be ready to tell them why you should qualify for a credit limit increase. Factors like being a long-term customer, paying your bill on time, or a recent income increase are all positive things to mention to the customer service rep when making your request. Know what you want and ask for a reasonable amount. If your current credit limit is $1,000, don’t ask for a $10,000 limit! You are more likely to get the increase you’re looking for if it’s a reasonable amount. A good rule of thumb is to ask for a 10%-25% increase. Offer to move credit. 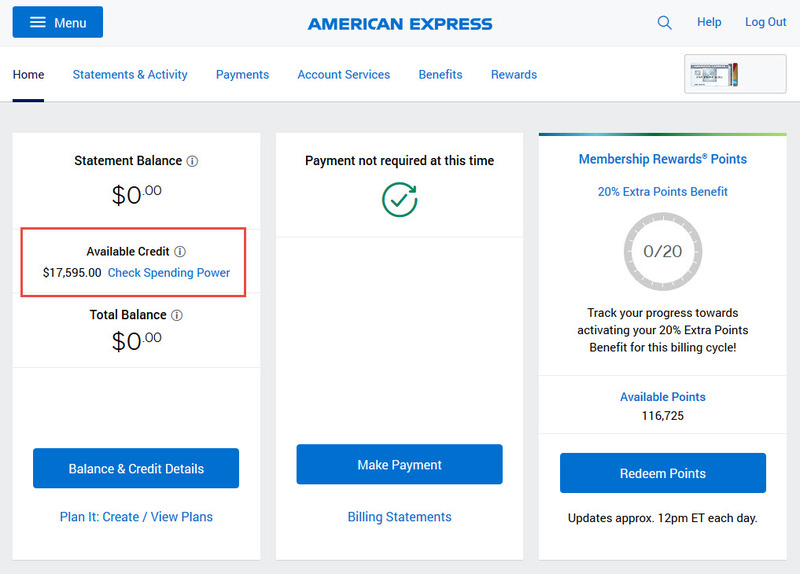 If you already have a large amount of credit from American Express, you can often move credit around from one card to another to get an increase on a specific card. If you are opening a new account, offering to take credit from one card to put toward the new one can help get you approved. Be polite. This one is simple, but it’s still important. The Amex customer service rep is just doing their job, so it’s never a good idea to be rude if you don’t get what you want. 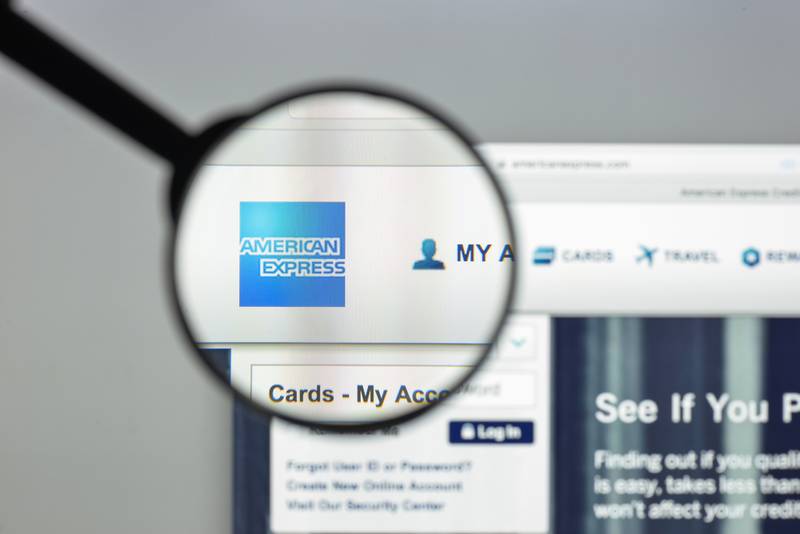 Balance transfers are a good way to persuade American Express to increase your credit limit. A balance transfer means you’re moving the balance from one credit card to another. It’s usually done to simplify and consolidate debt or to lower your interest rate. American Express balance transfers are usually completed within 5-7 days, but they can take up to 6 weeks to finalize. Hot Tip: Balance transfers only work on American Express credit cards, not charge cards. Banks love balance transfers because they typically charge a transfer fee, and will eventually get to collect interest on any balance that you don’t pay off in full by the time any promotional 0% interest period is over. Most American Express cards come with a standard balance transfer fee: 3% of the transaction, with a minimum of $5. However, you can occasionally find promotions offering a $0 balance transfer fee. Your request for a higher credit limit was denied — now what? The first thing to do is call American Express back and ask again. Make your case for why a higher credit limit should be extended (for a large purchase, balance transfer, or higher income), and your request may be approved. Many unofficial sources indicate that you need to wait at least 90 days after you are denied to make a repeat request. If your request is still denied, it’s time to look at your credit score and re-evaluate how you use the credit you already have. It’s a good idea to know what your credit score is so you can monitor it (and hopefully watch it grow). There are lots of places to check your credit score, and many are free. It’s a good idea to do this occasionally to make sure everything is correct and up to date. There are 3 main credit bureaus in the U.S.
Each of these sites charges a fee to see your credit report. However, there are ways to get it for free. Every year, all consumers in the U.S. are entitled to receive 1 free credit report from each of the 3 main credit bureaus. You are also entitled to get a free credit report if you were denied credit or experienced any other adverse reaction based on your credit report (such as identity theft). 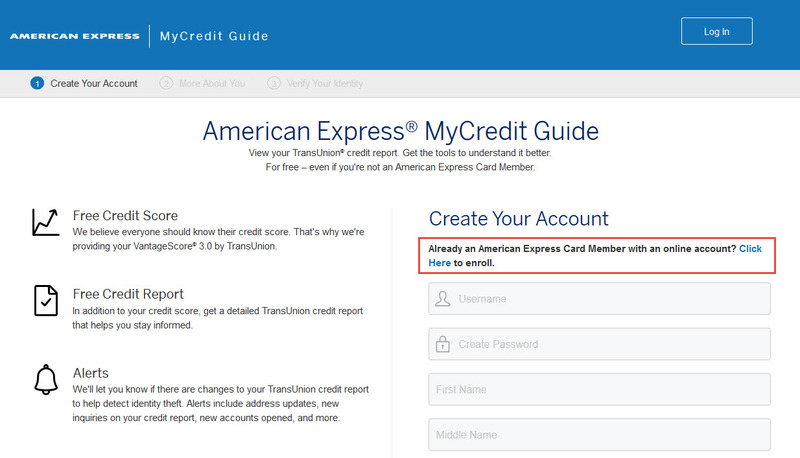 American Express also offers a tool that provides you with a free credit score — MyCredit Guide. This service is actually available to anyone, even if you aren’t an American Express cardholder. They will provide your TransUnion credit report and a weekly VantageScore® 3.0 credit score by TransUnion. Checking MyCredit Guide does not impact your credit score, so you can use it as often as you wish. You can access MyCredit Guide by clicking here or logging in to your online Amex account. Scroll to the bottom of the page and select Free Credit Score & Report. Click the blue Sign Up Now box. Fill out your information or take the shortcut if you already have an Amex account. Then click Continue. After you answer a few questions to verify your identity, you will be able to see your credit score and explore all of the MyCredit Guide tools. Image courtesy of MyCredit Guide. There are many legitimate reasons to want a credit limit increase. If you have been an American Express customer for at least 6 months and always pay your bills in full and on time, you are in good standing to request an increase. You can do this online or just make a call to Amex to state your case. If you are denied, it’s probably a good time to take a look at how you use credit. Make it a goal to pay off your bill in full on time each and every month. In addition to being the responsible way to use credit, it will help raise your credit score and will set you up to be approved the next time you request an increase. If all else fails, just be patient. American Express will often increase your credit if you are using it responsibly by paying your balance in full and on time. If you’re patient, you might get a credit limit increase without doing anything! 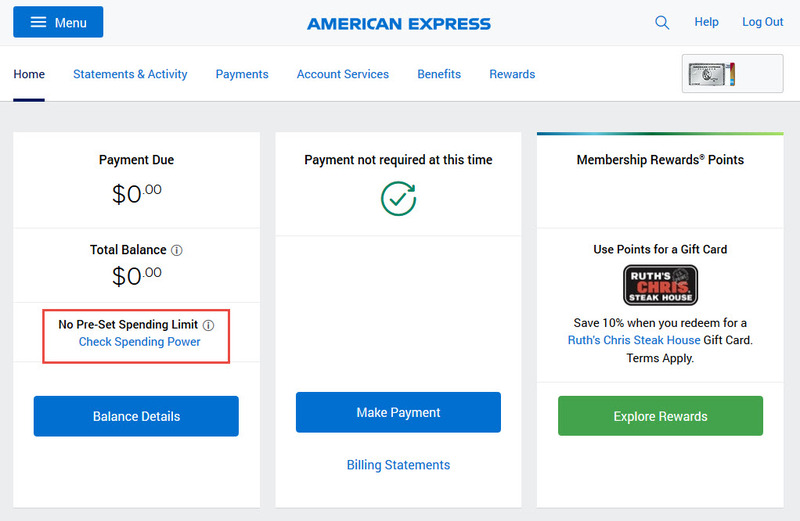 How long do I need to be an American Express customer to request a credit limit increase? American Express will only approve your request for a higher credit limit if you have been a customer at least 60 days. You should also have a good credit history, which includes paying your bills on time and in full each month. 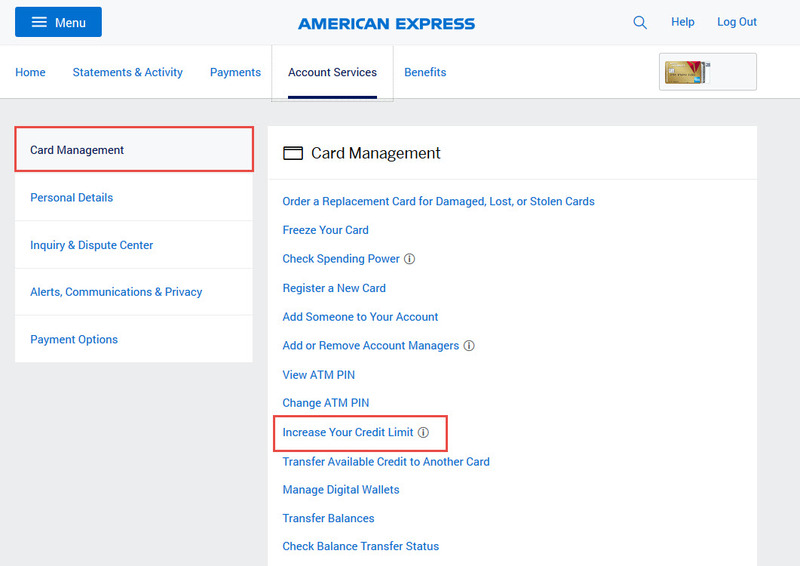 How do I request a credit limit increase from American Express? You can request a credit limit increase from American Express online or over the phone. To make your request online, log in to your credit card account and select Account Services > Card Management > Increase Your Credit Limit. Or you can call the number on the back of your credit card to request an increase. Will I get a hard pull on my credit report by requesting a credit limit increase from Amex? Generally, American Express does not do a hard pull on your credit report when you request a credit limit increase. Keep in mind, though, that this is not a rule and can always change.